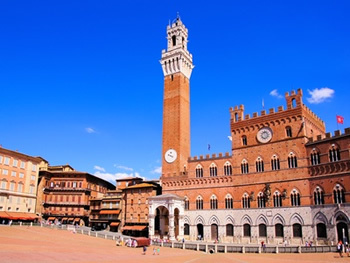 Your English speaking driver will meet you at the gang way of your ship or pick up location in Livorno with the requested vehicle to begin this day trip excursion to Siena and San Gimignano. Siena is the embodiment of a medieval city. Throughout the centuries, the inhabitants preserved their city's Gothic appearance, acquired between the 12th and 15th centuries. The whole city of Siena, built around the Piazza del Campo, was devised as a work of art that blends into the surrounding landscape. Siena is certainly the place in Italy where the traditions and the way of life inherited from a prestigious history have been kept alive. The town owes its wealth and importance to the fact that it was on a medieval route (Via Francigena) that linked France with Rome, and was travelled by pilgrims and merchants. Once in San Gimignano you will have all the time you need to see the highlights. Return to the ship in the late afternoon.